In November 1986, Connecticut radio station 106WHCN and television station WTXX (Channel 20) held a contest in which viewers could win a pair of tickets to the premiere of Star Trek IV: The Voyage Home, which opened on November 26th. 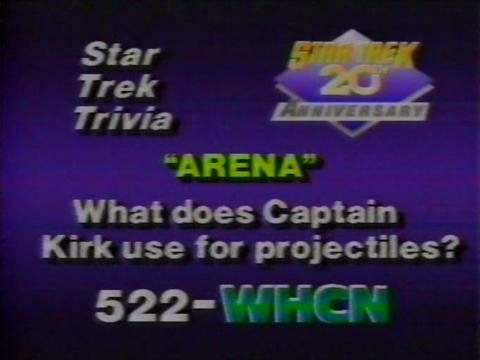 By watching Star Trek on WTXX viewers would be shown a trivia question. Then, at a specific time, if they listened to WHCN and heard the theme song to Star Trek they could call in with the answer. The first twenty callers with the correct answer were given a pair of tickets. This is one of the trivia questions introduced by WHCN personality Dianna Kelly.